BIRMINGHAM, Ala. — With the freight market booming and truck capacity constrained, now is an ideal time for fleets to fine-tune their freight networks, push for higher rates and increase driver pay, McLeod Software’s CEO said. 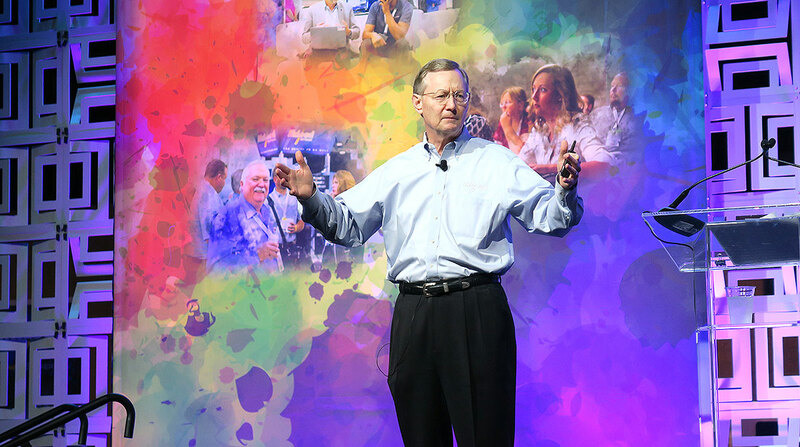 “Everybody has all the freight they can handle,” Tom McLeod said Oct. 1 at the trucking software company’s annual user conference here. Fleets can take advantage of this “unprecedented” environment by laying the groundwork for long-term success, he said. That starts with asking shippers for freight rates that are high enough for carriers to be reasonably profitable and invest in their businesses. It also is a good time for fleets to take steps to address their challenges with driver recruiting and retention. The abundance of available loads means that carriers also can be more selective about the freight they accept. Fleets can clean up their networks by turning down bad freight that isn’t adequately profitable, McLeod said. While trucking companies and third-party logistics providers seek to reap the benefits of these favorable business conditions, McLeod Software is working to help make them more efficient through better access to data. McLeod said his company is pursuing a development philosophy of “extreme connectivity,” in which fleets can use their management software to view and distribute information from the expanding array of technologies on their trucks and in their back offices. “Our aim is to put you right in the middle of your universe, and able to connect to all of the products and services that are required for you to compete and outcompete your competition,” he said. To make that possible, the company will continue to offer an open environment in which fleets can connect their software with whatever other systems are best suited to their market niches. McLeod Software supports product integrations with 121 other vendors, with nine more in development. While freight demand is high, truck capacity has been constrained to some extent by the federal electronic logging device mandate, McLeod said. That regulation, which went into effect late last year, requires nearly all longhaul carriers to record drivers’ hours-of-service data on ELDs rather than paper logbooks. In some cases, tighter adherence to HOS requirements is causing drivers to stop early to ensure they can find a place to park before they run out of driving time, McLeod said. To help mitigate such challenges, fleets can make better dispatching decisions based on the data available. Users of McLeod’s LoadMaster system can utilize its “driver feasibility” function to help select the best driver for a planned load based on factors such as the driver’s location, expected arrival time and available hours of service. The use of this immutable digital ledger could improve visibility in many facets of the supply chain, including food safety. McLeod cited a recently announced initiative by Walmart Inc., which will require its leafy green suppliers to trace their products from farm to store on its blockchain platform. Although that effort is directed at shippers, it’s clear that carriers will need to be involved at some point as well, McLeod said. McLeod Software is a member of the Blockchain in Transport Alliance, which is working to develop standards for the use of blockchain in the transportation industry. The company also is exploring how fleets will dispatch and manage the autonomous trucks of the future, and has begun conversations with truck manufacturers that are developing this technology, McLeod said. Fleet management and logistics planning will be “just as crucial” for highly automated or even unmanned vehicles as it is for today’s trucks, he said. A more mature technological development is the shift toward cloud computing. McLeod said 40% of the company’s new software deployments are hosted remotely on the internet rather than on customers’ on-premises servers. The number of companies on McLeod’s cloud-based platform has doubled over the past 24 months, but that still represents a minority of the company’s total customer base at 14% of all implementations.